A large cranberry farm operation in Pitt Meadows, B.C., is under investigation after several thousand fish were found dead while the farm was preparing to install a pipe to pump water from a river. "I've never seen anything like what I saw on that day," said local outdoorsman Jack Emberly, who reported the dead fish to Fisheries and Oceans Canada (DFO). Near the end of May, Emberly said he went on the North Alouette River in his canoe, as he has hundreds of times over the last two decades. He said he was shocked to find his boat surrounded by dead fish. He estimated 100,000 small fry were dead in the narrow river, including trout, salmon and stickleback. He said he called the DFO immediately. "They were just littered along the bank — little corpses. I thought something has killed these things. Something has to have caused this." Emberly and local environmentalists suspect digging on the riverbank by the owners of a cranberry farm, upstream of the fish kill, could have damaged the fish habitat. "It could be toxicity … it could be lack of oxygen. 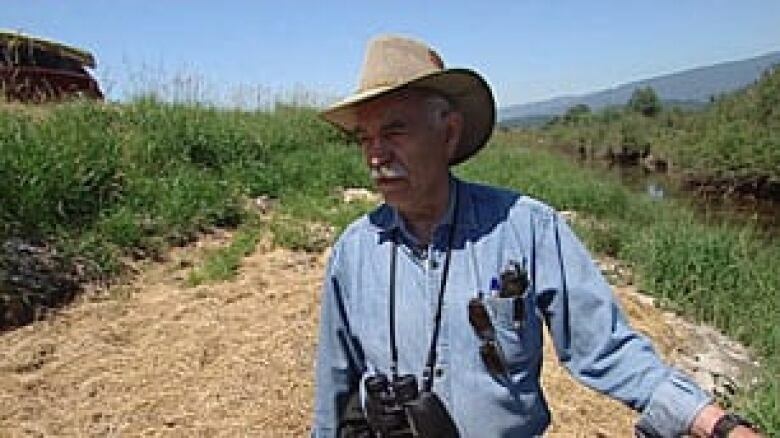 Those are the two likely causes of this kind of massive kill," said Emberly. At the time of the fish deaths, the Golden Eagle Group was doing preliminary work to install a large water pipe to pump thousands of litres of water out of the North Alouette River and into nearby reservoirs used to irrigate its crops. The Golden Eagle Group grows cranberries and blueberries on the largest piece of privately owned land in the Lower Mainland. It is part of the Aquilini Investment Group, which owns the Vancouver Canucks. "They want this river here in order to use for their industry. We want the river here for nature," said Geoff Clayton, president of the Alouette River Management Society, a volunteer group of environmentalists that watches over the river. Golden Eagle said it had been planning the new irrigation system for a year and hired an engineering firm to design the intake pump and assess the environmental impact. However, the company admits it carried out the excavation for the project and installed a pipe and pump before obtaining the necessary provincial water licences to operate the equipment. "We took a chance on that, and we could potentially lose the water and our crop, but we had to take a chance at that point," said general manager Rick Matis. "It started to become a very dry spring and we just needed the water at that point." Matis said the pump was not operational until early June — after the fish kill — and has not been used since, except for testing. If the company doesn't get approval to use the pump soon, it could lose this year's crop, he added. DFO spokesperson Terry Davis said the company did not consult federal authorities on its plan to tap into the river. "It is recommended that companies planning to undertake a project that has the potential to harm fish or fish habitat do come to DFO and do obtain the necessary authorizations. Because if they don't, and there is any harm to fish or fish habitat, they would find themselves in violation of the Fisheries Act," said Davis. Provincial and federal authorities are investigating, but Emberly and Clayton said both levels of government have been too slow to respond. "They pass the responsibility back and forth constantly," said Emberly. "I think the public comes out here and they think this area is protected …obviously our government is looking after it. But, I don't think they are." When DFO officials did not come to the site immediately after he called, Emberly said he went back to the river, scooped up several dozen dead fish and put them in his freezer. Geoff Clayton of Alouette River Management Society wants the river undisturbed. ((CBC))"I kept trying to get them to take the fish I had in my freezer for testing and nobody would do it," he said. The fish were eventually handed over to Environment Canada. "We will determine our next steps once we have the results of the testing," wrote ministry spokesperson Tracy Lacroix-Wilson in an email from Gatineau, Que. "Environment Canada enforcement officers conduct regular, planned inspections of activities regulated under the Fisheries Act. All reported kills are treated seriously and followed up." 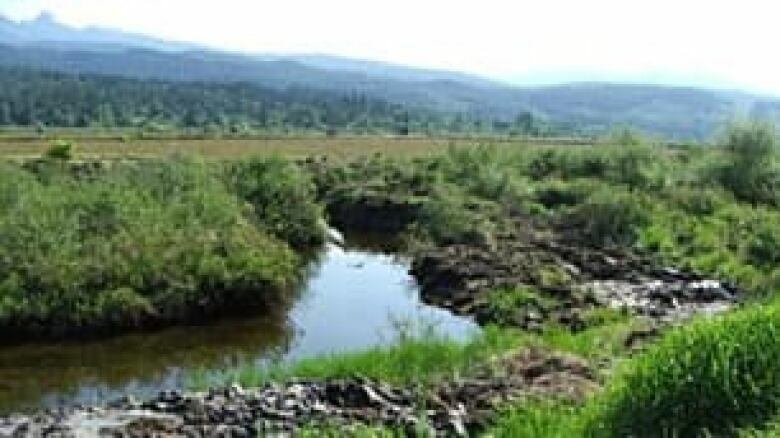 The provincial Ministry of the Environment said it is reviewing the 12 water licence applications submitted by Golden Eagle to take water out of the North Alouette River at various times of the year. The company had hoped to get approval on some of the licences in April. A spokesman for the Golden Eagle group told CBC News it wants to extract close to four million litres of water per season, which it estimates is a tiny fraction of the river flow. "The volume that goes past that river would probably be about a million gallons a minute," said Matis. "We want that river to be healthy, so that the flow continues and we can take a small portion of the water out of it." 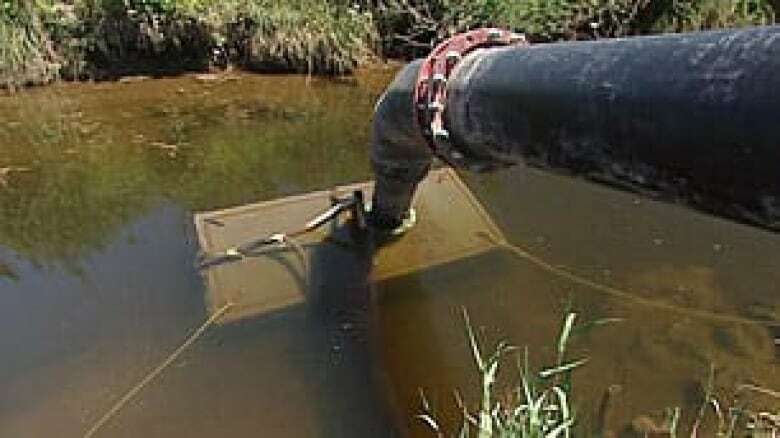 The provincial environment ministry is also investigating the recent installation of the pump prior to licence approval. "Staff are pursuing further investigation and following due process," wrote a ministry official in an email. "The water stewardship division has no evidence at this time to substantiate that the cranberry farm operations water withdrawals were occurring at the time and/or are responsible for the fish kill." 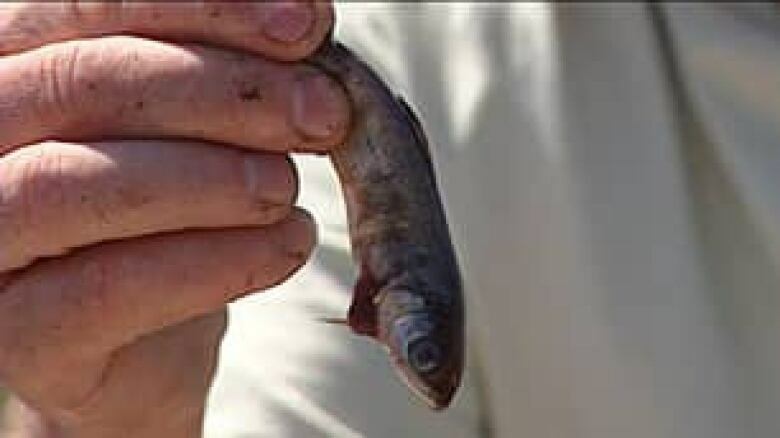 Clayton acknowledged the pump was not operational when the fish died, but said provincial authorities have not looked closely enough at the impact of the construction on the riverbank that occurred prior to the fish dying. "They have only a few people and they are desk bound," said Clayton. "They are not getting out and seeing what we are seeing. "We're here to tell them they better get off their desks, they better get out here, because we are upset and want something done," he added. Clayton said his group is not confident tests will be able to determine what caused the fish to die because of the time that has passed and the difficulty of trying to prove such things.